In today’s article, we will discuss how to migrate from BGP-enabled environment to MPLS BGP-Free core. By doing so, you will get yourself ready to provide new services to your customers, such as MPLS VPN, VPLS, IPv6, EVPN, etc. Please refer to ‘BGP Free Core’ article for more information. 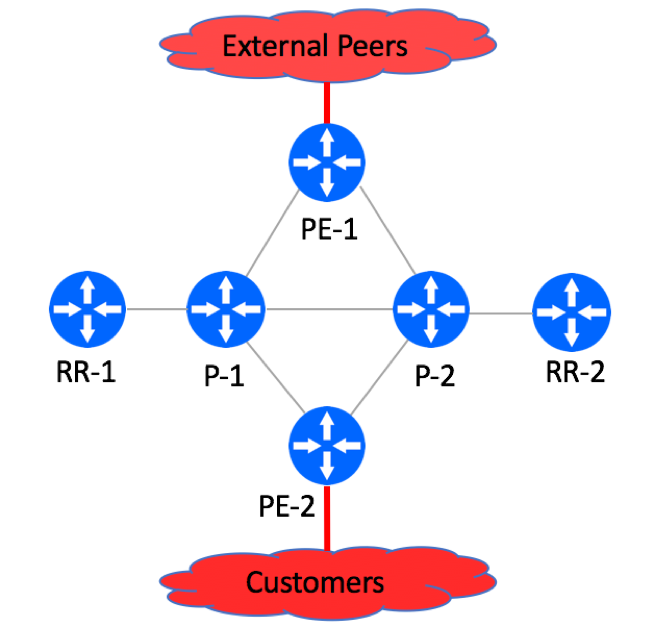 Our environment is comprised of two P nodes, two PE nodes, two Route-Reflectors, external peers and customers. 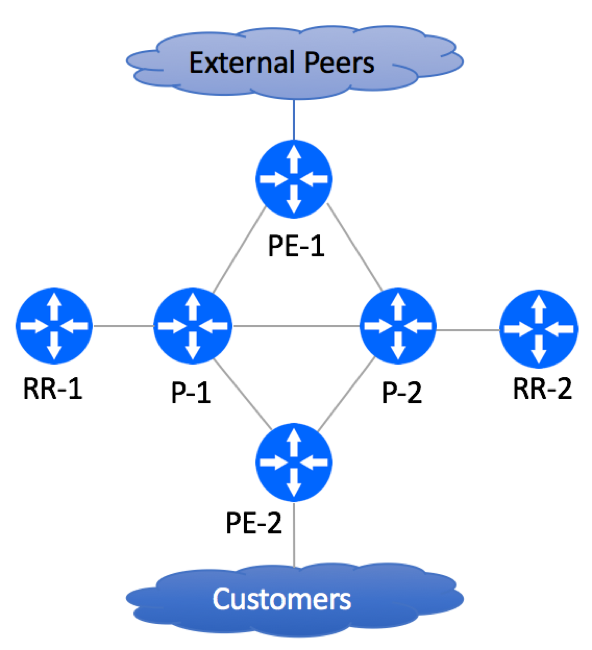 Obviously, your production network will have many more network elements, but the basic principles described in this article should be applicable to a network of any size. In our setup, we are running IS-IS as our IGP protocol. If you are more familiar with OSPF, you are welcome to run it instead. Before planning the migration, it is recommended to clean up your IGP (OSPF or IS-IS) and BGP domains. All customer routes should be carried in BGP, while all infrastructure routes must be carried in IGP. IS-IS is used as the IGP Protocol. Single L2 Area is configured on all P, PE and Route-Reflectors. There is no route summarization of any kind. All infrastructure routes (loopback and internal point-to-points) are carried over IGP. BGP is configured on all P and PE devices. 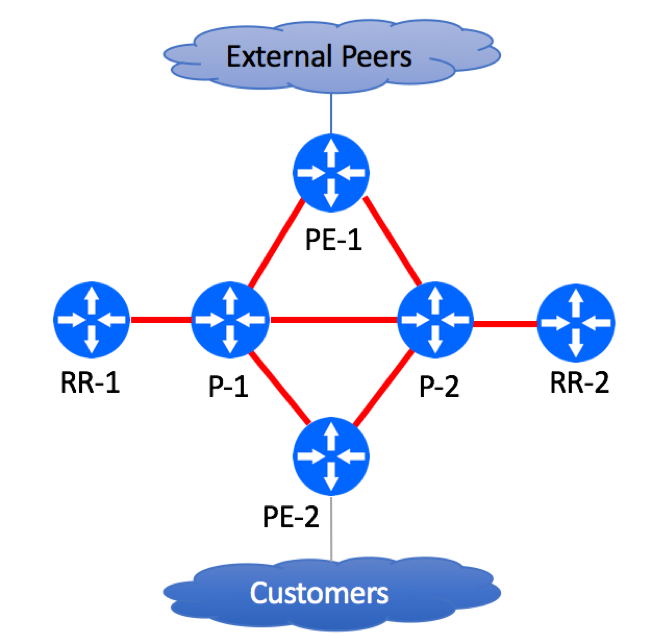 All customer routes, including customer point-to-points are carried over BGP. P and PE devices do not have direct IBGP sessions, but peer with two dedicated Router Reflectors. set protocols bgp group IBGP-RR authentication-key "$9$5znCO1hKMXtuMX7-2gTz3"
set protocols bgp group EBGP-Transit description "Upstream Peering"
set protocols bgp group EBGP-Transit neighbor 12.0.0.1 description "Upstream ABC: Circuit A1B2C3: NOC 701-456-8990"
set protocols bgp group EBGP-Transit neighbor 12.0.0.1 authentication-key "$9$QYgH3/t1RSM87uO87-V4oz36"
set protocols bgp group IBGP-PE authentication-key "$9$x1N-b2ZUH5Qn4aQn/CB17-V"
Figure below depicts physical network topology. ’70.0.0.0/8’ prefix is advertised by the Upstream Peer. ‘120.0.30.0/24’ prefix is advertised by the customer. During our simulated migration, we will be using these two prefixes to monitor traffic behavior changes. 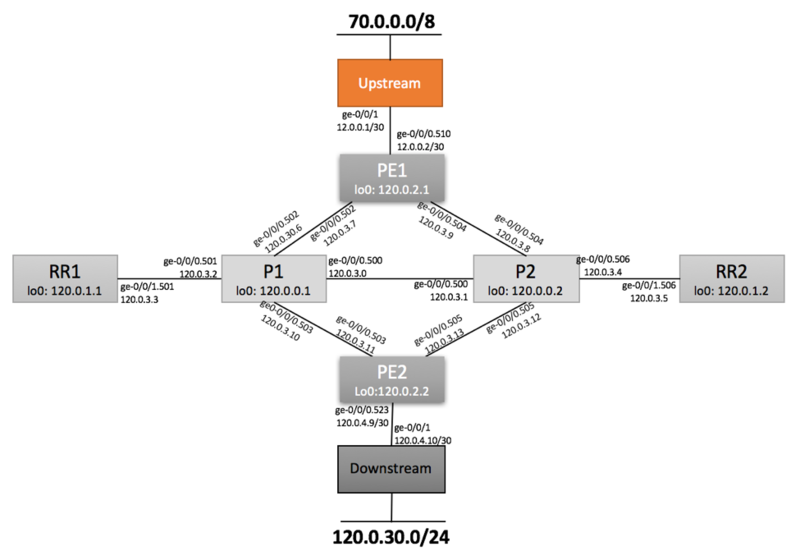 Increase MTU size on all P to P and P to PE links in order to compensate for MPLS header. The actual MTU to be assigned to the interfaces should depend on routers’ interface capabilities and underlying Layer 2 transport. If possible, set the MTU to the maximum size supported by the routers. If running OSPF, MTU change will trigger OSPF flap. Make sure that you do this during maintenance window. Don’t forget that MTU change should be done on both sides of the link and MTU settings must match on both sides. You should be using RE Protection Firewall Filter on all your devices in order to protect your infrastructure from external attacks. Enable MPLS protocol on transport links. set security authentication-key-chains key-chain ldp-chain key 0 secret "$9$32FA/A0EclLxdBIxdbsJZn/C"
set security authentication-key-chains key-chain ldp-chain key 0 start-time "2017-1-1.00:00:00 +0000"
Next step is to start enabling LDP protocol. We recommend Inside-Out approach, where you start with the Core and expand LDP domain to the Edge. You would leverage the same configuration technique as before. Refer to ‘Understanding LDP-IGP’ Synchronization document if you are not familiar with this feature. Make sure all sessions are in ‘Operational’ state. At this point of your migration, you have enabled LDP across your P and PE networks. P and PE Loopback Addresses are now present in both inet.0 (populated via IS-IS) and inet.3 (populated via LDP) tables. Now that the traffic is using Label-Switched Paths, you can disable BGP on P devices. The safest way to do this is to deactivate BGP on P nodes, make sure traffic is still flowing and no customers are complaining and completely remove BGP during next maintenance window. 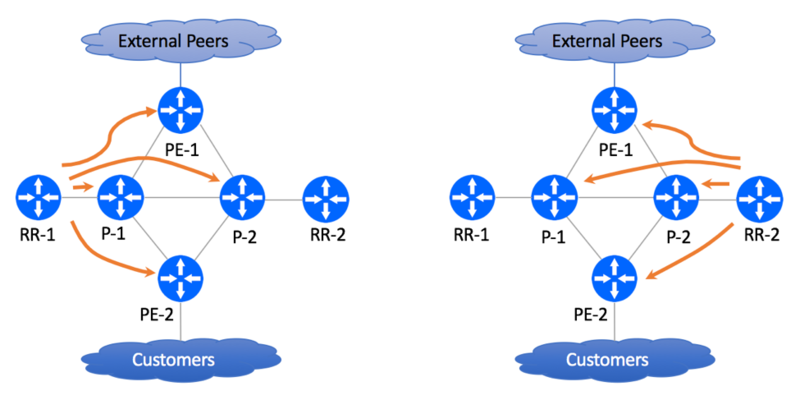 After disabling BGP on P nodes, BGP-advertised customers’ and peers’ routes will no longer be present in P routers’ routing tables. mpls.0 table will be populated with Label IDs used for Label Switching. Previous Previous post: What Routing Protocol Should I Use?